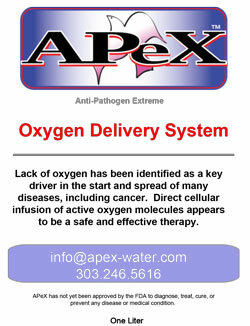 APeX Water adds oxygen to weak, oxygen deprived cells. It strengthens them to reverse a condition called Hypoxemia, the condition of low oxygen. The combining of water and oxygen, as a therapeutic intervention, seems intuitively right as a method of introducing natural medicine to the body. The human body brings together the two components, water and oxygen. Their ubiquitous presence in our bodies is essential to life. The body is composed of 70-80% water. Water is 89% oxygen by weight. Our blood is normally suffused with high amounts of oxygen. Normal blood oxygen levels are 95-100%. A level below 90%, can result in hypoxemia. 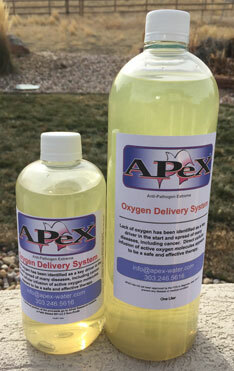 Altogether, oxygen comprises 62% to 71% of the body. Through the complex roadmaps of our arteries and veins, blood transports of all of this oxygen throughout our bodies. Ninety percent of all of our biological energy comes from oxygen. It is the most essential element that the human body requires in order to not only survive, but also to have optimum levels of energy, function properly, and be productive. Of course, getting more oxygen into the lungs is always a good idea. We can accomplish this through exercise and conscious deep breathing. When we breathe deeply and vigorously, oxygen molecules travel from the air into the blood. But, if breathing deeply were a cure-all for disease, resolving bodily afflictions would be much simpler than it has proven to be. Part of the reason that merely breathing in more oxygen fails as a panacea is because only 15% of the oxygen we breathe is absorbed into the bloodstream. In order for oxygen to be delivered to the most important places in our bodies, the cells and tissues throughout the body, we need to get oxygen to enter into the blood directly, quickly, and efficiently. That enables oxygen to be carried, without loss, to the cells and tissues that are hungry for this vital, life-sustaining substance. Today, we are globally oxygen deprived for many reasons. First, the oxygen depletion of our air has become a serious concern. The atmosphere should ideally contain about 20% oxygen. In polluted and urban areas, the level is typically as low as 10%. Yet, we continue to cut down our trees and rain forests, which provide our planet with large amounts of oxygen. Trees breathe in carbon dioxide, and they give off the oxygen that we can then breathe in. Fewer trees mean less oxygen for us to breathe. There are additional reasons why we are oxygen deprived. Water in nature contains oxygen (the “O” of the H2O equation). However, tap water is not the same as water in nature. It contains far less oxygen because it must travel first through pipes to get to us. As a consequence, it loses its contact with air. Treating our municipal waters with chlorine also removes oxygen. Processed foods, even cooked foods, has reduced oxygen content of our food. Fast food and packaged food is processed in a way to give it a long shelf life, and this is accomplished by making the food oxygen-poor. Finally, the over-prescribing of antibiotics reduces our oxygen levels. This destroys the oxygen-producing aerobic bacteria in the digestive tract. While these causative factors of cellular oxygen depletion are well known, there is another reason that is rarely talked about. Not only are our oxygen levels low, but also so are our carbon dioxide (CO2) levels. In today’s hurried world, most of us breathe too rapidly. (One of the many values of yoga and meditation is that they slow down the rate of breathing.) When we breathe too quickly, we exhale too much CO2. When we get rid of too much CO2, we drive down the oxygen levels in our bodies. As a result, our cells turn unhealthy. For all these reasons, many, if not most of us, are living as oxygen-deficient beings.